High-Tech design inner liner fully supports the outer skin, providing a show worthy inner structure which is smooth, rigid, and ready for prep & paint. The Cormat reinforced surface is both strong and straight. Steel anchors allow for use with OEM hinge. 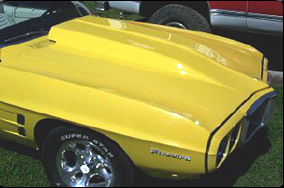 Side 90� edges are left long, scoops & baffles come closed & require opening to make the hood functional. Lighter tension springs may be required.